Para/Site Art Space is pleased to announce the launch of the 2008 publication Lawrence Weiner in Hong Kong: A Documentation. Edited by Tobias Berger, Christina Li, and Carmen Tomfohrde, this 128-page, tri-lingual catalog provides documentation of Lawrence Weiner’s 2007 Para/Site exhibition and his related activities in Hong Kong. Opening with an introduction by exhibition curator Tobias Berger, the catalog includes transcripts of Lawrence Weiner’s talk at the Hong Kong Art School, the artist’s radio interview with Sarah Passmore, and a conversation about calligraphy between Lawrence Weiner, Tobias Berger, and calligraphy expert and curator “Johnson” Tong-zung Chang. 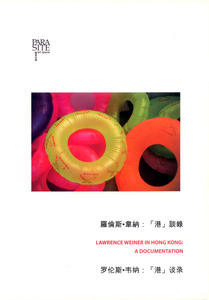 More than 50 color photographs capture the Lawrence Weiner gallery exhibition at Para/Site Art Space, which included installing silk-screened life preservers at Hong Kong’s Star Ferry Pier 7 and later distributing silk-screened inflatable children’s life preservers a local beach.